Michael Ferguson, auditor general released his spring audit Tuesday in Ottawa. The final report suggests Public Services and Procurement Canada failed to properly manage the project, and did a poor job of consulting other departments and agencies during the development of Phoenix to determine what they needed the system to do. 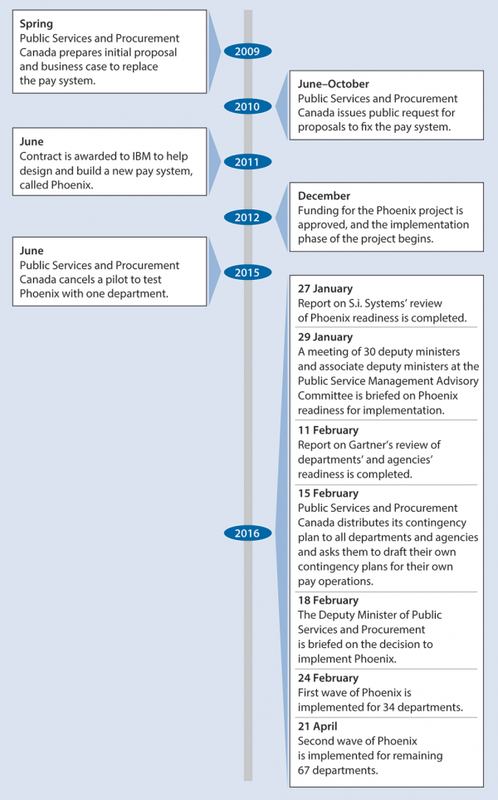 A timeline of key Phoenix milestones. Source: Office of the Auditor General of Canada. “This meant that the Deputy Minister did not receive independent information showing that Phoenix was not ready to be implemented or that the Miramichi Pay Centre and departments and agencies were not ready for Phoenix,” said Ferguson. IBM Corp. was awarded a contract to help design, customize and implement new software to replace the government’s old pay system in 2011. After the planning phase of Phoenix in the spring of 2012, IBM told Public Services and Procurement Canada that Phoenix would cost $274 million to build and implement. The Treasury Board had approved a Phoenix building and implementation budget of $155 million in 2009, but according to the report, Public Services and Procurement Canada didn’t ask the Treasury Board for more money to build the system. Instead, Phoenix executives worked with IBM to find ways to minimize the scope of the project to fit the approved budget. “Executives decided to remove critical functions and curtail system tests,” said Ferguson, pointing to retroactive pay and other important pay processing functions. During a recent Senate testimony in April, IBM Canada executives explained senior officials within the federal government were warned about the Phoenix pay system’s unrealistic rollout schedule. IBM also said they continued to voice their concerns from July and August 2015 until January 2016, a period that spanned the federal election and saw the Conservative government replaced by the Liberals. IBM execs suggested the Phoenix software is sound, and it was poor management and a lack of training around the technology that led to tens of thousands of public servants shortchanged across Canada. The report says that as of June 30, 2017, there was more than $520 million in pay outstanding due to errors for public servants serviced by Phoenix who were paid too much or too little. The report’s recommendations include mandatory independent reviews of the project’s key decisions and inform the Deputy Minister and senior executives of the reviews’ conclusions.